Euro-Divers Maldives offer scuba diving activities in some of the best scuba diving resorts in Maldives as well as water sport activities at selected resorts. Euro-Divers maintains several dive centres here. In fact, we started it operations more than 40 years ago near Male, the capital. And with 12 dive shops operated by Euro-Divers Maldives in as many scuba diving resorts, you are sure to realize your dream diving holiday in paradise. From schools of rainbow coloured reef fishes, lion-fishes, barracudas, wale sharks, mantas, moray eels, lobsters in small caves to white tip sharks and grey reef sharks everything is just there to be discovered by divers. In the Maldives, Euro-Divers and A.W.A.R.E. programs support the efforts of the Maldivian government to keep this beauty. Endangered sharks and turtles are protected. ‘Protect the Maldives’ is in all our interest! Scuba diving in Maldives, exploring renown dive sites or taking scuba diving lessons in crystal clear waters are experiences you will never forget. The Maldives are hidden in the middle of the Indian Ocean. Here, divers will discover an oasis of peace. A natural wonder of unimaginable beauty both above and underwater. In the Maldives, time stands still. In today’s hectic world, the Maldives’ Islands have not lost their charm and will seduce divers and non divers alike. Maldives, The Paradise on Earth, is a title gained by its spectacular underwater world, a world of its own, with a wide and unique variety of fish life. Crystal clear, emerald green lagoons, pure white sandy beaches and as far as you can see; the deepest blue sky. For the scuba diving holiday of a lifetime, the Maldives are truly a diver’s paradise. 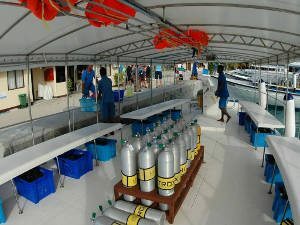 The comfortable, traditional maldivian dive boats are mostly equipped with a sundeck, first aid and oxygen equipment as well as with a radio and mobile phones. In between the dives we offer scuba divers small refreshments on board our dive boats. Some of the dive centers offer speed boats for special scuba diving excursions which offer ambitious divers even more and a further range of dive sites. 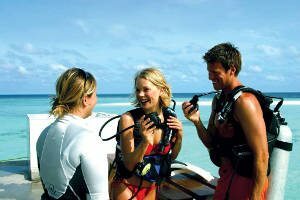 On your diving holiday in Maldives, whether you choose an individual dive package, a beginner scuba course or diving lessons for experienced scuba divers, we offer it all. Our dive centers in the Maldives offer all courses and scuba diving lessons from beginner diver to Dive Master as well as many scuba diving specialties and a wide range of dive excursion programs for divers such as daily morning and afternoon dives, early morning dives, night dives, special full day excursions, wreck dives, special hammer head dives and much more. Diving Maldives is a passion we like to share. We also offer Nitrox for free for Nitrox certified scuba divers. Our professional and multilingual scuba instructors would like to make your dive holiday a very special one and will help you to find the best program and scuba diving lessons for you and your wishes and requirements. Service is a pleasure for our teams and we will bring all your scuba gear to and from the dive boats to the dive centre. Bauer compressors, Nitrox membranes (Club Med Finolhu Villas, Club Med Kani, Eriyadu Island Resort, Kurumba Maldives, Velidhu Island Resort, Vilamendhoo Island Resort), BCDs, regulators with SPG and Octopus, dive suits (3mm shorties). Dive computers, underwater lamps and much more. The dive centers and dive shops do have one or several class rooms for courses. For guests with their own scuba diving equipment we have either separated areas or an own equipment store rooms for available. In some of the dive centers we integrated a small shop with T-Shirts or other small scuba diving related articles for sales. To keep the highest standards when it comes to scuba diving equipment or diver training is a must. 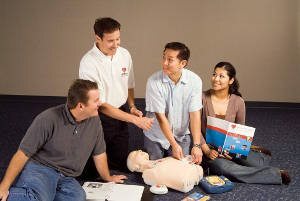 All our training is done using the latest audio-visual materials available. We firmly believe that prevention is the best medicine, therefore we recommend you to consult a doctor specialized in diving medicine prior to conducting scuba diving activities. Because your safety is important to us, we will provide you with state of the art scuba training and diving equipment. Our standard scuba diving equipment includes mask, snorkel, fins, weight belt, BCD with direct feed, regulators with octopus and pressure gauge, dive computer, 10lts or 12lts aluminum tanks with both DIN and INT connections. Nitrox filling stations add to the new way of life in scuba diving. All our dive boats are equipped with radio, first aid kits and oxygen kits. A decompression chamber is available in each area we operate dive shops. We care about you and strive to make of your diving holiday a safe, fun and unforgettable scuba diving experience. The site consists of three main large sections of the reef; a reference line is attached to a hole on the reef at 13meters. From the three sections of reef the starting point of the site is on the bigger section which is 50 meters across in length, the smaller section of the reef is about 10 meters in diameter. The reef is healthy in coral life and divers can observe tuna, white tip sharks and a lot of banner fish. On the main section of the reef both sides have overhangs at depth starting from 18 to 30meters. The dive can be conducted like a spiral around the reef. A small current is recommended as always in either out going currents or ingoing currents the site will always be done half with the current and the other half against the current. Divers should be careful not to move to far away from the Thila as in poor visibility you can easily lose the Thila. You can at times encounter nurse sharks among the overhand with spotted stingrays. Thila shaped like a teardrop between 16 and 30m deep. About 250m long – one of the most spectacular dives of this atoll, for scenery as well as prolific fish life. West and north coast are covered with soft corals and schools of red bass or even big-eye trevallies. Top reef is about 20m. There are some outcrops and overhangs where the soft coral outgrowth is very good, but the nicest feature there is the nearly sure meeting with grey sharks, white tip sharks and eagle rays that should be found on the north east of the reef, along with tuna and barracuda. To finish in style on the top reef where the hard coral is still intact, green turtles and maybe a school of batfish might accompany us. South side of the channel of Guraidhoo (Local Island). The reef slopes from 6 to 30m on the outside and from the surface to 30m on the inside. It has a very abundant fish life, as well as overhangs and caves. Can be dived with an in going or out going current. The best conditions are with an in going current. When the current is strong this dive is suitable only for experienced divers, due to the washing machines. But it is suitable for all divers with a weaker current. The site offers schools of banner fish, fusiliers, tuna, rainbow runner and more. Under the caves and overhangs we find beautiful sea fans, sponges, as well as a lot of groupers. Deeper we should come across grey sharks, white tip sharks, eagle rays, sting rays. A big napoleon seems to have taken place there and often comes to see the divers. If there is small current we could enjoy looking for the small, such as nudibranchs, shrimps, moray eel getting cleaned, turtles are often found on the top reef. You can also meet dolphins in the blue during winter time. One of the 15 Protected Marine dive sites of the Maldives. Located in North Male’ Atoll south of Girifushi Island. This reef about 100 meters across is an amazing reef with beautiful corals, overhangs, caves, outcrops, a swim through and loaded with the best fish life making it one of the most exciting dives in North Male’ Atoll. It is best recommended to dive here with a small or a medium current as the site is not big enough to drift along for an entire dive. With out going currents divers may start the dive jumping in the blue and drifting with the current towards the Reef while keeping with the left hand shoulder to it. The top of the dive site can be a spectacular place to be as the pelagic tend to hunt here; It includes Tuna, giant trevellys with schooling big evey travelly and also eagle rays. As you drift in you will come across a butterfly shaped rock with overhangs reaching depths of 25-30 meters. Under the over hangs it is really beautiful with red soft corals on the ceiling. In this overhang you can see a chimney-like formation; while keeping on drifting you will come across more coral outcrops and overhangs at depths ranging from 18 to 25 meters. As you ascend shallower you will find the top reef colonized by many Sea Anemone clown fishes. Large coral and good fish life makes it ideal for divers to spend the end of the dive on the top reef. Care should be taken while diving on this site which is more recommended for advanced divers with good buoyancy as the coral is very fragile and with strong currents it can become a tricky dive site. Nassimo Thila is a reef which stretches around approximately 150 meter in an oval shape and where the average depth on the top reef is in-between 10-15 meters. This dive site is the “mother” of all dive sites in north male’ atoll it boasts of coral and beautiful soft coral. The colors on the dive site are spectacular ranging from blue to red and yellow. Every inches of the reef are fully covered with hard and soft corals. The other attraction of the site is its massive coral pinnacles which are abundant in fish life and soft corals. The shallowest part on the coral blocks top to about 15 meters and drops towards the blue to 30 meter below. By the side of the main Thila are over hangs which are covered with blue soft coral and huge sea fans. Schools of blue line snappers and oriental sweet lips are a common inside the overhangs often stingrays can be seen resting under the small overhangs. With an outgoing current the dive you may drift while keeping the Thila on the right hand shoulder as you reach the northern end you will arrive on a series of overhangs covered with blue soft coral. The site could be done with a medium current making it a dive site favorable for the open water divers as well as advanced. Nassimo Thila is definitely one of the best dive sites in North Male Atoll.